Visitors to this year’s Race Retro can look forward to an exciting array of vehicles in the Pride of the Paddock, and picking a winner is going to be tougher than ever. Just about every discipline of motorsport will be represented at Stoneleigh Park from 22-24 February. From rallying to stock car racing, these five cars are just a taster of what show-goers can expect. Christopher Downham has owned his 1935 Riley 9 Ulster Imp 12/4 Special since 2015. 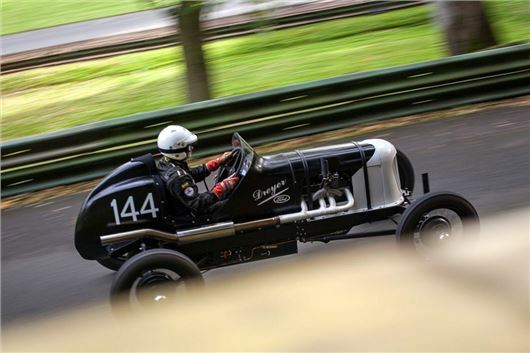 The delightful two-seater is powered by a 1.5-litre four-cylinder engine producing around 100bhp, and Christopher has enjoyed competing in a number of VSCC events, including the historic Bo’ness hill climb. It is no surprise that plenty more outings are planned for 2019. Those who love rallying won’t want to miss the 1968 MGB, brought to the show by John Watson on behalf of the MGB Register. It boasts a fascinating history having taken part in the epic 1968 London to Sydney Marathon where it finished in 41st position overall. Discovered languishing in a scrap yard in 2015, it has been meticulously restored and now appears just as it would have done more than 50 years ago. Few motorsport enthusiasts can resist the excitement of the Le Mans 24 Hour race, and Lorraine Gathercole’s 1971 Lola T212 was originally run there by Dorset Racing Associates. The car ended up in America but returned to the UK in 2016 and the detailed restoration was completed two years later. It wears a period correct colour scheme and is powered by an 1840cc Cosworth engine. Lorraine is Chair of the British Women Racing Drivers Club and took the car to the fearsome Spa circuit for its first outing, finishing third in class. And a further taste of Le Mans history comes in the form of a 1959 Triumph TR3S, owned by Paul Hogan. After competing at that year’s 24 Hour race it was broken up by the factory, but Paul has reconstructed the car using as many original parts as available and the TR3 still retains its original chassis number. The car has since appeared at numerous events, including the Le Mans Classic and Silverstone Classic, as well as taking part in the driver’s parade ahead of the 2017 British Grand Prix. Doug Martin’s 1927 Dreyer Ford sprint car has had a full nut and bolt restoration after being discovered in a Pennsylvania barn and is believed to be one of the first built by Floyd ‘Pop’ Dreyer. It uses a Ford Model A engine and running gear as well as a very rare Frontenac sprint car bellhousing/rear engine mount, manufactured only when these multiplate clutches were in use. Originally built as a dirt oval racer, which is still the single most common form of auto racing in the United States, the Dreyer is still being used in UK sprints to this day. Tickets are now on sale for Race Retro, powered by Motor Sport, held from February 22-24 2019 at Stoneleigh Park, Warwickshire, with free parking for all visitors. For the latest updates and ticket information, visit www.raceretro.com.